Lap Swim: A time reserved for lap swimming and other conditioning activities. Private lessons available during this time. *No lap swim during Family Fun Night Open Swim, 3rd Wednesday of every month, 6:30-8:30pm. Open Swim: A section of the pool is dedicated to activities for all ages. Lifeguards will be present and water slides may be turned on at their discretion. Children under 9 MUST be accompanied by an adult. *Every 3rd Wednesday for Family Fun Night. Rental: A time reserved for pre-booked special programming in the pool. The Gauntlet: A time reserved for Gauntlet party rentals, a floating obstacle course for children ages 6+. Contact a Reservation Specialist at 365-7393 for more information. For more information, please click The Alaska Club East or call (907) 337-9550. 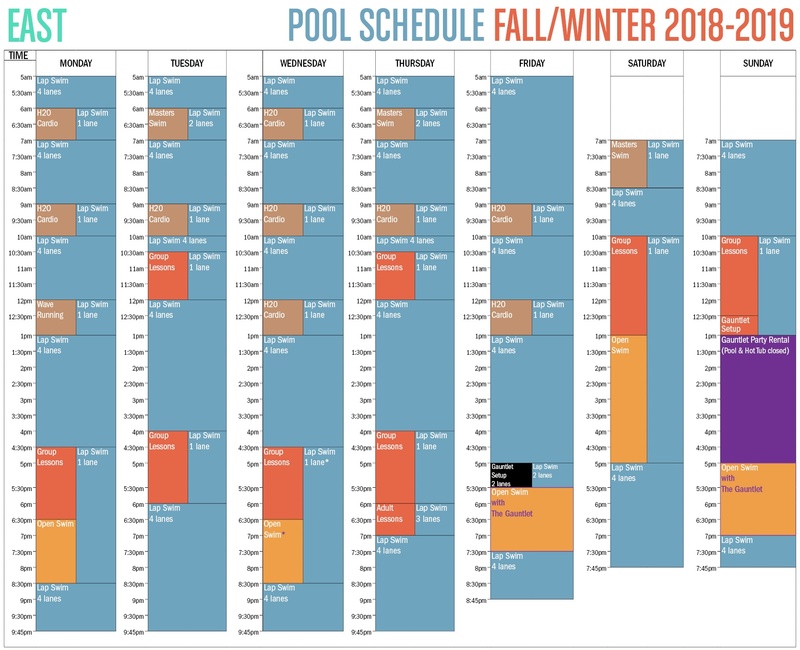 For the East group fitness class schedule, click here.